Melting Moments – The Ultimate Indulgence. 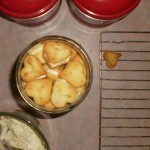 This is my update on the very best recipe for melting moments I have ever encountered. These biscuits have become near legend in offices I’ve worked in around Perth. I still get the odd forlorn message from ex-workmates letting me know they miss my biscuits…. When I cook them for my current workplace I always make a jar to send to our second office. It’s a big call, but I would say these would be near the top of the list as an all-time greatest biscuit. 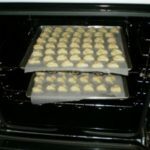 My favourite biscuits to cook, share and of course eat, they are quite fragile and have a momentary gentle biscuit crunch to them before they dissolve into a gentle lemon tang. 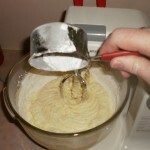 I use a biscuit press, this allows the biscuit mix to be made super light and give me a perfect size biscuit. 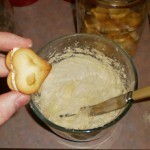 I use the heart-shaped cutter, not out of any particular fondness for heart shapes, but because they stack well in a jar and are just the right bite size once the two biscuit halves are assembled. The biscuit press also ensures I have uniform biscuit halves. 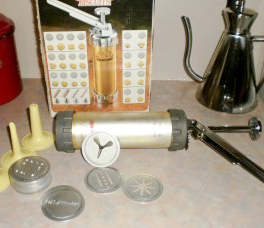 The one in the picture is about 30 years old and made of Aluminium, It has a few attachments that are great for icing and for filling profiteroles. You can buy stainless steel ones at most homewares shops for under $40 and I have a few of them but I keep using this one, mostly for the nostalgia. 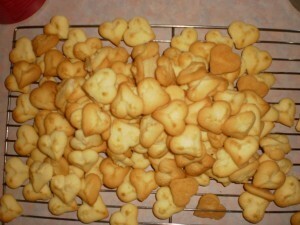 I grew up with my Mum using it for Italian style biscuits, and have now borrowed/taken ownership of it. 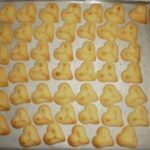 The disc that produces the heart-shaped biscuits is leaning against the body of the press in the picture. 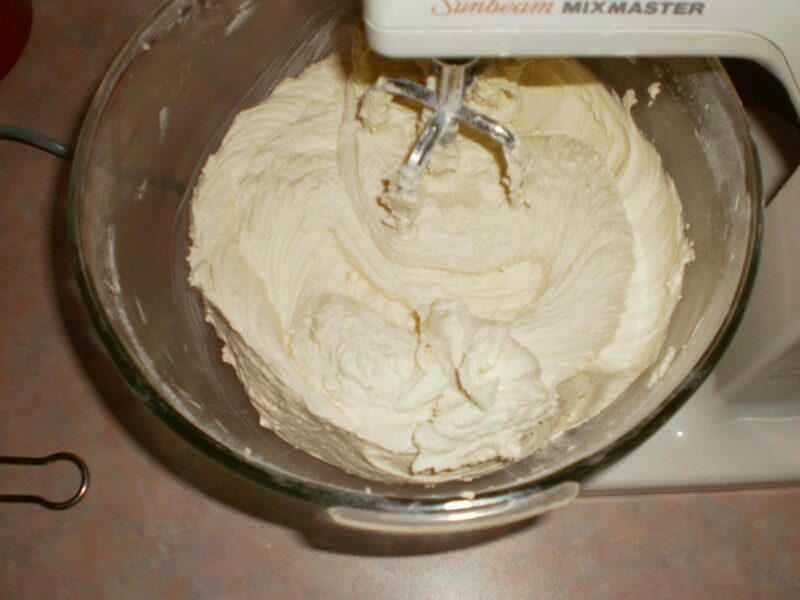 Start by whipping softened butter with electric beaters. The butter must be soft, but definitely not liquid. 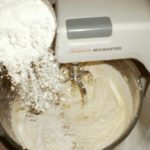 Add the icing sugar in parts and whip until combined and the mix is light and fluffy. Add the cornflour in parts and mix until it is all combined. The texture should be smooth and light. Add plain flour in half cup amounts and mix well after each addition. 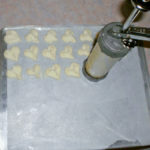 The aim is to keep a light, soft, smooth mixture that will be able to be forced through a piping bag or biscuit press. Spoon into a biscuit press or a strong piping bag fitted with a large star pastry tip and press the biscuits onto a tray lined with baking paper. Or you can use a very strong piping bag to pipe rosettes on to a lightly greased oven tray. Bake in moderate oven 10-12 minutes or until golden brown. Join biscuits with lemon cream icing. Zest a lemon with a microplane or a nutmeg grater. 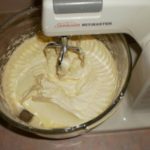 Whip butter and lemon zest with electric beaters. Gradually add sifted icing sugar and continue beating until mixture is light and creamy. Gradually add lemon juice and vanilla. Add extra icing sugar as needed to ensure a stiff icing mixture. 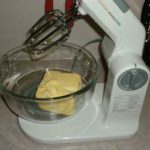 Use a butter knife to spread the icing onto the back of a biscuit, press down the other half gently then load into your jar or barrel. 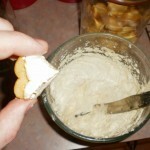 Makes about 40 complete biscuits using a press. These will keep for about a week and a half in an airtight container and are even better on the second day. 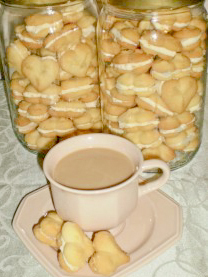 The freshly made Melting Moments will be very fragile and the icing takes a while to set firm. This is why I stack mine carefully into a tall container ready to be eaten the next day.